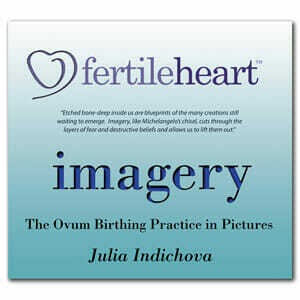 but Gen, Anna, Sarah and countless gorgeous Mamas, got more from the unique Fertile Heart OVUM pictures than they got from tens of thousands of dollars worth of drugs – a spontaneous biological pregnancy. For others’ the Imagery CDs and the Fertile Heart Natural Fertility Program was a the tipping tool that helped tilt the scale of that last winning IVF. Then there were Moms who didn’t think they needed any of this “weird self-improvement stuff.” After all Egg Donation was a sure fix. But when that first Egg Donation cycle failed, the Fertile Heart toolbox became their last hope. Not flaky and far from just a relaxation tool, The Fertile Heart OVUM way of working with pictures is different from anything you’ve ever done. 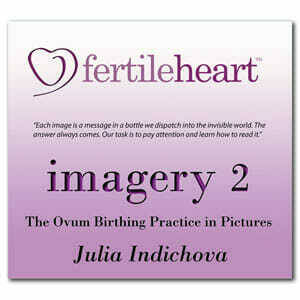 I know because I know how every one of the imagery remedies in the Fertile Heart toolkit was conceived and born. I didn’t make them up. 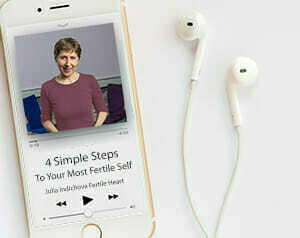 Every single one of the powerful Fertile Heart “fertility drugs” was conceived as I searched to find answers for my own “incurable infertility,” and through the thousands of hours I spent supporting the people who found their way to my books, teleconferences and workshops. Here is one imagery you can use, next time a fertility expert, or your well meaning best friend starts giving you a thousand reasons why a pregnancy is just not in the cards for you. This one is from my second book, The Fertile Female: How the Power of Longing for a Child Can Save Your Life and Change the World. There are many more remedies to pick from on both Fertile Heart Imagery CD’s, take a look at the description of each and let me know if you have any question. And if you’re looking for company and want to experience the power of these tools with my guidance, you can find me on one of the 3 Session Intro Calls, or in a workshop, or an occasional Free Chat. So be sure to keep in the loop. Introductory Fertility Support Teleconference Series check our Events page. Above all, remember that you’re more fertile than you ever imagined! Intention: To protect yourself from the damaging effect of other people’s opinions, labels, statistics, or any damaging energy radiating from others. Close your eyes, observe your breath for a few seconds, then breathe out three times with a long, slow exhalation. Invite an image of an impenetrable Golden Shield made especially for you by the Ultimate Mom’s masterful craftsmen. Breathe out once. Invite an image of the person whose pronouncements might be damaging to you. Raise your Golden Shield and see the words, numbers, and any damaging energy radiating toward you bounce right off the shield. Know that the Golden Shield of protection is available to you anytime you need it. There are many more drugs like this one on both Cd’s. Here are a few more powerful remedies you can reach for when you start obsessing about labels such as “advanced maternal age” and “poor responder” to stimulation or any other assessments of your fertility that do not serve your best interests. From Fertile Heart Imagery CD One: New Beginnings, Sacred Choices, Circle of Protection. From Fertile Heart Imagery CD 2: Cutting the Cord, Mirror of Truth, Mosaic of Revelations.